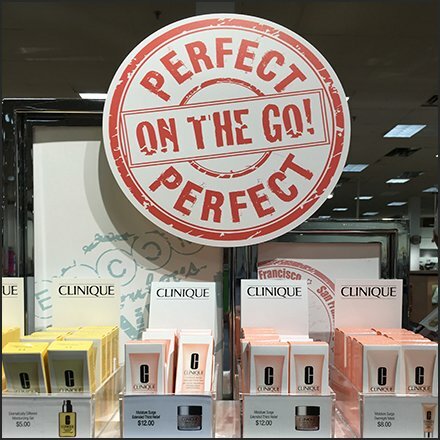 This Perfect On The Go Display by Clinique uses their word perfect not mine. But I might have to agree. The “Perfect On The Go” circular masthead is eye catching, and by employing a “stamp like” graphic execution adds a hidden sense of “immediacy.” The promotional proposition is repeated on the shelf edges. An unbalance, asymmetry adds visual interest. And the Perfect logo even repeats at the base for any prone to shuffle their feet while browsing. Step through the Perfect On The Go Display by Clinique gallery of images to study the concept, and the range of Clinique offered. Seen at Bon-Ton.